Slovenian Kaja Draksler was born in Kranj, north-west of Ljubljana, on the 6th of February 1987, with musical blood in her veins. She has been creating music already since the age of 4, playing the piano. At high school in Ljubljana she further developed her piano studies, playing rock music, pop music and jazz. "It was just a coincident that I started to play jazz. I enjoyed it a lot and jazz has a lot of possibilities for improvisation. At some point, I started to play more jazz, because playing jazz was a challenge to me. Of course you can also improvise in other kinds of music, but jazz offers a more sophisticated manner of improvisation and that's what I enjoyed." Kaja Draksler is a remarkable talent. At a relatively young age she became a pianist and composer. After her studies at high school in Ljubljana, which she finished in 2005, she went to Groningen (the Netherlands), where she studied 4 years. She obtained her Bachelor's and Master's Degree in jazz piano with honours at the Prince Claus Conservatory in Groningen in 2009 and started to study classical composition in 2010 at The Conservatory of Amsterdam with Richard Ayres, a famous British composer and music teacher. She finished her composition studies in Amsterdam in September 2013. Since 2007 she has been working with EMJO (the European Movement Jazz Orchestra). They released a debut CD in 2011 with Clean Reed Records, called 'Live in Coimbra', a project for which she has been commissioned to write the music. Also in 2007 she composed a concerto for accordion and orchestra, entitled 'Orpheus and Eurydice', recorded and performed by Janez Dovc and the Slovenian Philharmony Orchestra. At the age of 22 she won the Deloitte Jazz Award 2009 in the Bimhuis in Amsterdam, an award for talented jazz musicians who live in the Netherlands and who are starting an international career. In 2012 she performed her first solo project at the Jazz Festival of Ljubljana, a concert which was released with Clean Feed Records in 2013. Also in 2013 she released her first, impressive solo CD, entitled "The Life of Many Others". 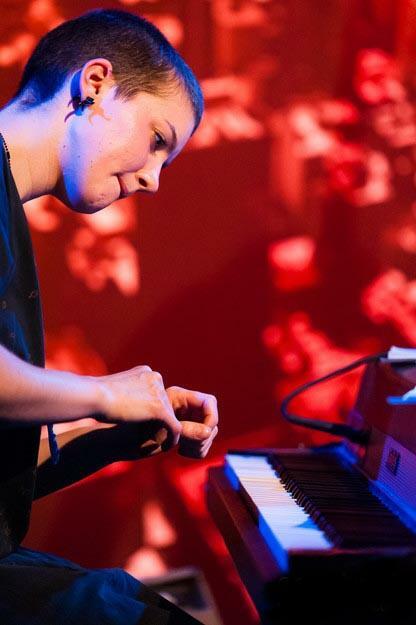 Kaja Draksler performing a solo concert at the Bimhuis, Amsterdam, on 27 November 2013. Here we watch and hear the young avant-garde pianist playing one of her own compositions: "Soothe my Soul, Feed my Thought". In this piece of music Kaja does what she loves most: improvising jazz music. At a certain point, with one hand playing the piano, with the other she touches a singing ball inside the piano used for meditation. Later on she uses two mallets, drum sticks with soft ends, stretching the strings of the piano, thereby creating soft effects. The title of the composition, "Soothe my Soul, Feed my Thought", will not be explained by her. She says: "Behind every composition is a personal story. But I am not going to tell you about that. I want my listeners to place their own interpretation on my music." While studying at the Prince Claus Conservatory in Groningen, Kaja went to New York for half a year in 2009, to study jazz piano at the Purchase College, the State University of New York, which has a world-class reputation in offering both intellectual and artistic talents an opportunity to develop their musical talent further. In New York she took private lessons from the great musical innovators of this moment, Vijay Iyer and Jason Moran. Her very personal music, her performances and studies made an indelible impression. Already in 2005 she co-founded the Acropolis Quintet in Groningen (see below). She is also the founder of BadBooshBand and she has been commissioned to write for a number of prestigious orchestras, such as the Metropole Orchestra, the Italian Instabile Orchestra and others. She has been performing in many European countries. Her student years in Groningen appear to have been very fruitful. Kaja: "I went to Groningen at the age of 18. I learnt a lot during my studies in Groningen, especially from my piano teacher Marc van Roon." Van Roon is a well-known jazz pianist, who applies the art of improvisation as the main source of inspiration. He has composed several songs and orchestra pieces for dance companies and various music ensembles and produced a number of CDs. In Groningen Kaja Draksler also studied with Michael Moore, an American-born jazz musician a saxophone and clarinet player. Kaja: "Both Marc van Roon and Michael Moore were very important and inspiring to me. Not so much with regard to my technique, but more in the sense of discussing things and exchanging ideas. And Michael is a saxophone player, so we also played a lot together, which helped me. Michael kind of introduced me to the improvised music. That was a new scene for me, it opened my eyes and I raised a lot of questions. It led me into new directions." Also her studies at the Conservatory of Amsterdam were very successful. Kaja: "I started to study classical composition in 2010 in Amsterdam and in 2013 I wrote my Master's thesis about Cecil Taylor." Cecil Taylor is a great American classically trained pianist and poet, generally acknowledged as one of the pioneers of free jazz. His music is characterized by an extremely energetic, physical approach, producing complex, improvised sounds. His piano technique has been likened to percussion and described as 'eighty-eight tuned drums' (referring to the number of keys on a standard piano). Kaja Draksler is fascinated by Cecil Taylor, although she also admires Thelonious Monk. But Cecil Taylor, known for developing a completely personal musical language, impressed her a lot. With her Master's thesis on Cecil Taylor she won the EPTA Frans Schreuderprijs (EPTA is the European Piano Teachers Association) in 2013. 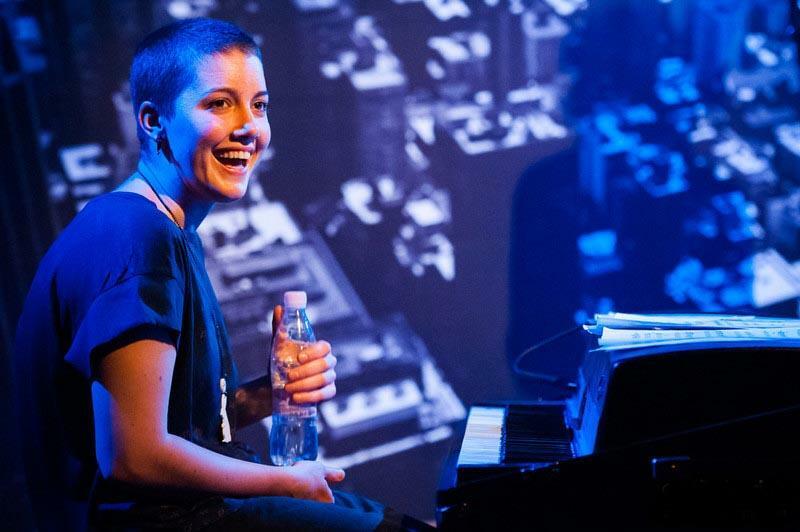 The jury was deeply impressed by the "brilliant and thorough" research work of Kaja Draksler on Cecil Taylor, his musical language and the coherence of his free improvisations. In particulair the jury commended "the extraordinary effort she made in transcribing the very complex piece of Taylor (his recording of Life as ......) completely by ear, making it possible for the classically educated reader to gain insight into the structure of the piece with the help of music notation." Kaja Draksler emphasizes that she truly admires Cecil Taylor, although she never met him. "He is a great pianist and of copurse I learned a lot by studying him and his works of music. I am sure there are influences of his style in my piano playing, although I wouldn't call myself a free jazz pianist. I only started with improvisation 3 years ago. I am not really using his musical language in my playing. I wouldn't be able to do it, because it is too specific and too complex. But his ideas and his way of being an artist are very inspiring to me." The Acropolis Quintet at its best in an highly-artistic, colourful performance called 'The Prophet'. Jazzy Kaja Draksler excels in fluid piano playing, caressing and hammering the keys. A phenomenal transcending of borders. Musical bizarrerie and brilliancy. Kaja Draksler leads an international cast of characters and influences in her Acropolis Quintet, with musicians from Romania, Italy, Slovenia and Turkey bringing their own sounds to bear on the music. In 2011 the Acropolis Quintet was chosen as one of the three best groups in Europe for a 12 Points Plus Program. The 12 Points Festival, based in Dublin, with partners right across Europe, promotes young, creative and ambitious artists in jazz and related music from all points on the continent. At the end of each festival, three bands are chosen to participate in a two year mobility cycle called 12 Points Plus. The Acropolis Quintet played in different countries in Europe and released two CDs (Türkü and Akropola). The Quintet performed at the Composer's Festival in Amsterdam (2012) and in Brussels at the Winter Jazz Festival 'Flagery', 2013. To Kaja Draksler the Acropolis Quintet is like her 'own child'. She enthuses: "I enjoy very much playing with Acropolis. It is one of my main projects for sure. "'Kaja Draksler can best be described as a 'pianistic percussionist' demanding her musical freedom. "In music I don't make compromises." The Acropolis Quintet, founded in 2006, consists of: Sanem Kalfa (vocals), Kaja Draksler (piano), George Dumitriu (guitar & electronics), Mattia Magatelli (bass), Kristijan Krajncan (drums). Turkish singer Sanem Kalfa developed her own style by enriching jazz with colourful Turkish tradition. She approaches arrangements of jazz standards with her own interpretations include pieces which evoke strong emotion through traditional Turkish and jazz, as well as own compositions and a few classical pieces, especially written for cello. Romanian guitarist George Dumitriu, born in Bacau, has a classical music background. He studied classical violin, graduating from the National University of Music in Bucharest in 2005. After finishing the classical studies in Romania he started his guitar jazz studies at Prins Claus Conservatorium (Groningen). Mattia Magatelli, bassist and composer, was born in Bormio (Italy) in 1979. He started studying the bass as an autodidact. In 2000 he moved to Milan where he attended courses at the Civic Jazz school studying with Enrico Intra and Franco Cerri. He played in several renowned ensembles in Italy and in 2007 he won the Siena jazz scholarship for international seminars Jasi, attended in June 2008 in Riga (Latvia). In 2008 he won another prize with Gianluca DiIenno and Matthew Rebulla for the competition “Bergamo Jazz Treviglio”. Kristijan Krajncan, born in 1986 in Kranj (Slovenia) studied violoncello at the Music School Vic-Rudnik in Ljubljana, Slovenia, with Igor Mitrovic. At the same time he visited the high school of Music Ljubljana playing jazz drums. He graduated in jazz drums in 2004 and continued his studies at the Prins Claus Conservatorium (Groningen, Netherlands) with Owen Hart Jr., Joost van Schaik, Ralph Peterson and Steve Altenberg where he graduated in 2009 with the highest possible grade. The music of Vodnjak (The Well) was made in collaboration with filmmaker and visual artist Daniel Boccato and recorded live at the Muziekgebouw aan 't IJ in Amsterdam. Musicians: Pascal Meyer (piano and organ), Kaja Draksler (piano and 'Glockenspiel' - bells play) and Ryoko Imai (percussion).